The worst way to try and get your troops into battle is just having them walk there. Tac. Marines, Terminators, and Dreadnaughts aren't known for breaking any land speed records, and they're vulnerable to enemy fire as they approach. Sure, there's Rhinos and Land Raiders, but those only hold a relatively small squad of guys. 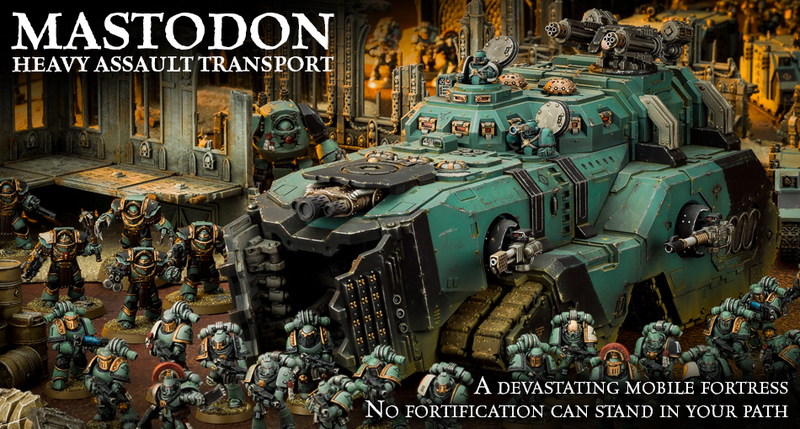 If you really want to get a bunch of Marines to where you need them, you might want to check out the Mastodon Heavy Transport. This mass of ceramite and guns can get 40 Space Marines where you need them. It's big enough to even carry Dreadnaughts. It's armed with various weapons to take on whatever might try and stop it. Up top is a siege-sized melta array. You need the enemy walls breached? This is the vehicle for the job. You can order yours now, with shipping to happen next week.